A body frozen in ice. A freak accident leading to such an occurrence is tragic and frightening, but what if it’s something more? Consider Ötzi, the 3,300 BCE era “Iceman” whose frozen remains were found in the Alps. Discovered in 1991, at first, it was thought he was a hapless mountaineer recently deceased. Tests later proved his age of “nearly four thousand years old” and another startling fact: he was likely murdered. Flash forward to 2015, in Bones on Ice, a body discovered on Mount Everest is shipped to Charlotte, NC. Forensic anthropologist Temperance Brennan is called in to confirm identification. The well-connected Blythe Hallis wants local id of her daughter’s remains. Brighton Hallis was “a Charlotte kid who died trying to summit Everest” three years ago. “Sherpas identified bodies sufficiently shifted by avalanche activity to allow recovery. Brighton’s was among them.” Her body had been recently dislodged by a deadly earthquake in Nepal. This factual occurrence—the Gorkha earthquake struck Nepal in April 2015, killing nearly 9,000 people and injuring thousands more—somewhat shaped the story, according to the author’s note (more on that later). Temperance receives the “frozen cargo” of the Everest remains as the story opens. It’ll be a challenge to make positive id. She’ll need to wait for the body to thaw, which must be done slowly, because shattered dentition makes a quicker determination impossible. Why do I get the impression the teeth were deliberately smashed? To learn more about Brighton’s final moments, Temperance visits Blythe Hallis, her voice a “fusion of cut crystal and Carolina honey,” her demeanor perfectly poised and polished. Temperance learns about Brighton’s competitive nature and goal of joining the Seven Summits group, a goal achieved by climbing the highest peaks on each continent. She’s also put in contact with Brighton’s climbing team: Dara Steele, Cash Reynolds, Damon James, and Elon Gass. Turns out Brighton and her team were “auditioning” for a reality show about mountaineering. They all had experience climbing, but weren’t “eight-thousanders.” All the other Seven Summits are under 7,000 meters above sea level. And these altitude virgins weren’t prepared. “The rule is to turn around by two P.M.” Time to reach the summit and get back to camp safely. But “rules meant nothing” to Brighton, and she was certain she’d have time to summit. She even stopped to help another solo climber, a woman from South America, at Hillary Step. Then a snow squall struck. “The next day, a Taiwanese group found her body in an alcove on the South Summit, about a hundred and fifty meters below the top.” The body was “frozen in place” and left behind. The other climber was reported in bad shape and was airlifted out. Of course murder is involved here. That would be any mystery reader’s supposition from the start. How it all unravels, along with the tidbits of mountain climbing, is what’s fascinating. Anticipating the twists may be easy for veteran genre fans, but there’s perfect irony in the ending. I did feel a little perturbed by one character’s portrayal though. It seemed unnecessary for that character to turn out, as expected, as such a black-and-white villain. I would have preferred more shades of gray. It’s an all too typical characterization, a common archetype, that’s cropped up with frequent regularity in recent years. Many times it’s valid, but here seemed a bit unnecessary. Otherwise, this relatively standalone entry to the Temperance Brennan “Bones” series serves as an excellent introduction for new readers and a quick read, quick fix for fans. The novella, published in 2015, is available as an ebook and is included as one of four novellas in the print book, The Bone Collection. 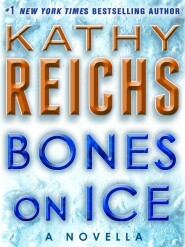 In the author’s note, Reichs mentions the inspiration for Bones on Ice coming from an article she read about the “more than 2000 bodies frozen in the so-called death zone of Mount Everest.” The body of famed mountaineer George Mallory has been frozen in place on Everest since 1924. And literally, one section of Everest is referred to as “Rainbow Valley,” named for the colorful gear of the corpses littering the terrain! Reichs was in the middle of research and writing the story when Nepal was struck by the aforementioned earthquake and ultimately completed the novella in honor of the lives lost.